The Oneida Nation of Wisconsin is the largest tribe of Indians in the State of Wisconsin. With over 16,000 tribal members, the Oneida Nation is more than double the size of the next largest tribe, the Menominee. The Oneida are originally from central New York State and are one of the original five nations of the Iroquois Confederacy. The word "Oneida" in English is derived from the Oneida word "_____," which is how the Oneida people referred to themselves in the Oneida language. _____ (Oh-Nhu-Yo-Day Aahg) is translated as "People of the Standing Stone." 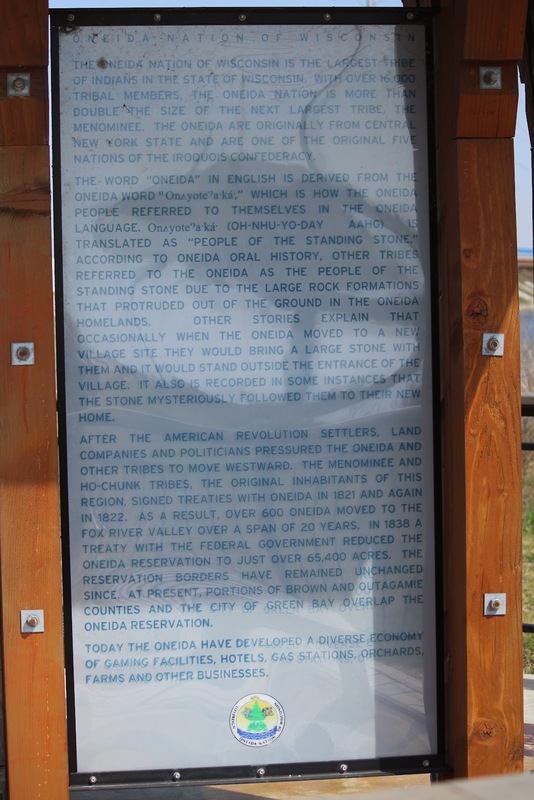 According to Oneida oral history, other tribes referred to the Oneida as the people of the standing stone due to the large rock formations that protruded out of the ground in the Oneida homelands. Other stories explain that occasionally when the Oneida moved to a new village site they would bring a large stone with them and it would stand outside the entrance of the village. It also is recorded in some instances that the stone mysteriously followed them to their new home. After the American Revolution settlers, land companies and politicians pressured the Oneida and other tribes to move westward. The Menominee and Ho-Chunk Tribes, the original inhabitants of this region, signed treaties with Oneida in 1821 and again in 1822. As a result, over 600 Oneida moved to the Fox River Valley over a span of 20 years. In 1838 a treaty with the federal government reduced the Oneida reservation to just over 65,400 acres. The reservation borders have remained unchanged since. At present, portions of Brown and Outagamie Counties and the City of Green Bay overlap the Oneida reservation. Today the Oneida have developed a diverse economy of gaming facilities, hotels, gas stations, orchards, farms and other businesses. 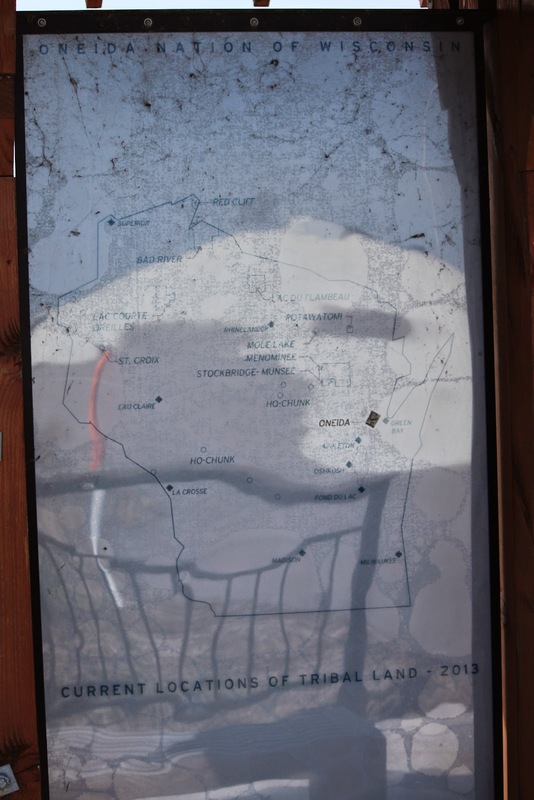 This location is Overlook 3 (see map below) in a series of historical marker kiosks that comprise the Tribal Heritage Crossing of the Wiouwash State Trail. Click here for more information about the Tribal Heritage Crossing project and links to photos / transcriptions of all markers on the Trail.